Overnight breakfast casserole, loaded with flavor and truly the best breakfast casserole we have ever eaten. I like to butter some white bread, and place it in a 9″ x 13″ pan. Cook the sausage, mix the rest of the ingredients, and put that mixture in the pan. Cover the overnight casserole and place it in the fridge for the night. In the morning you get up, turn on the oven and place your overnight breakfast casserole in the oven. I remember when my friend Sandra, gave me this recipe. I tried it on Christmas Eve, and now it is a must. Every one knows that we will be having overnight breakfast casserole for breakfast Christmas morning. We use to buy our kids their favorite cereal, and then let them eat it for breakfast, then I got to the point that I only wanted to be making food one time on Christmas and the cereal just wasn’t filling them up. They where hungry 2 hours later. So I was very happy to get the overnight breakfast casserole recipe. Everyone in the family loves it. 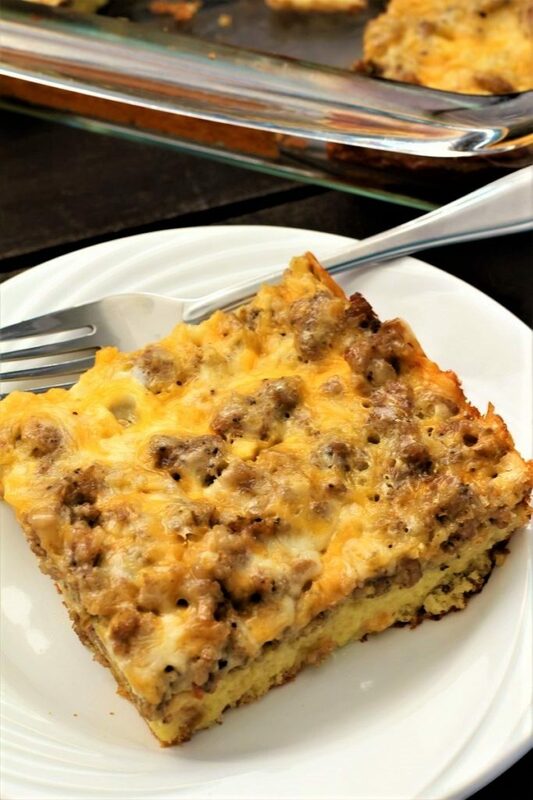 Last year when our church had a morning get together for Christmas, I took the overnight breakfast casserole and I had one of our friends come up and say, this is the best breakfast casserole I have ever eaten, better than my wife’s, would you share the recipe with her? So I was going to tell her to go to the blog and she could find the recipe, and when I looked, it was no where on the blog. I couldn’t believe it. So here it is for my family and friends. I hope that you enjoy it as much as we do and that it will make your life less hectic! I love the saying “life is to be enjoyed, not just endured”! (Gordon B Hinckley) Sometimes, it is some of both. But I hope that most of it is enjoyed! We like to get a puzzle, usually no more than 500 pieces. Once in awhile we do a puzzle with 1000 pieces, but it seems like we get burned out before we get it finished. My sister use to get so mad at me when I was little, she would get a puzzle for Christmas. She would work on it and if she didn’t get it finished, she would leave it and go to school. I was young and I had no idea that she wanted to finish the puzzle, I thought that I was helping! I would finish about the last 15 pieces for her. I know that you are all on my side, and that you agree with me, I was just being nice. Some times when you are a youngster, you do not think about stuff like people wanting to finish their own puzzles, or that moms get tired and that sometimes they just do not want to cook dinner because they can’t think of anything to cook. Does this sound familiar? I went out of town this week, and I was sure that when I got home my two youngest would be dead from starvation. However, my daughter fixes her own food a lot, but my youngest, not so much. They were alive and well when I saw both of them. Then, I went to scouts, that is because I am a den leader over the bears, and while I was gone, my oldest son came to get his mail. I hadn’t even fixed any dinner. He was probably hoping that I had something, but I didn’t. So, he came in and had a bowl of cereal. That is not what I like to hear my kids eating for dinner. At least at my house. In fact, we just do not even eat much cold cereal around here any more, so I guess it was a good thing that he came and ate some before it went stale. However overnight breakfast casserole is one thing that doesn’t go stale. I loved that I had some cereal on hand. That night my same son came over for a minute and I had left over lasagna, or overnight breakfast casserole, and he chose the over night breakfast casserole. I think it was because he is not a big lasagna fan. He eats really fast and I think one day he ate too much and too fast! Oh well, more for me! 1- First I cook all the sausage. You could save the left over sausage and use it in the healthy egg muffins. 2- If you do not care for sausage, use ham or bacon. 3- If you like green peppers, you could also add them to the sausage. 4- This will store in the refrigerator in an air tight container for up to 3 days. 5- I have always used white bread so I do not know how others taste, but I am sure that they are great! Butter one side of the slices of bread and place them in a 9" x 13" pan, butter side down. Cook the sausage in a skillet, and when the sausage is cooked, drain it on a paper towel. In a mixing bowl, whisk together eggs, dry country gravy mix, and the milk. Then I stir in the cheese and the sausage, make sure that the sausage is not too hot, (or you can sprinkle the sausage on the bread). Leaving the foil on, place it in the oven and cook for 40 - 50 minutes or until the center comes out clean. I check mine with a butter knife or a toothpick. I love that you make this up the night before and bake off in the morning. This is perfect when company comes to visit. I agree with you 100%! That way we can focus on people and enjoy visiting with them! Thank you so much for stopping by! I love a good overnight breakfast casserole – awesome for entertaining or simplifying morning potlucks. I have one that I use, but it has me cube the bread. I’m going to try your version where that’s unnecessary and make it even easier! I am with you, I too like to simplify things. I hope you enjoy the breakfast casserole! Thank you for checking out the recipe! I love breakfast that I can make ahead of time. Oh, I am so with you! Any time we can recipes ahead or fast, it’s a win, win! Thank you for stopping by! Great idea for Thanksgiving brunch. You are right! Thank you for the great idea! I appreciate you stopping by! Make ahead breakfasts are the best! They really are, and we absolutely love this one. We have it every Christmas morning. Thank you for your comment. This looks like the perfect make ahead breakfast that will feed a crowd!! Pinning! This is our Christmas morning breakfast. It is a tradition that we started several years ago. Actually a lot of our traditions center around food. I’m not sure what that says about us!!! I love an easy breakfast! thanks for sharing! Pinned to make for my family!! This overnight breakfast casserole is our favorite breakfast casserole, hands down. It is fabulous. Love this idea of making it the night before. I have lots of company coming for the holidays so I am making this. 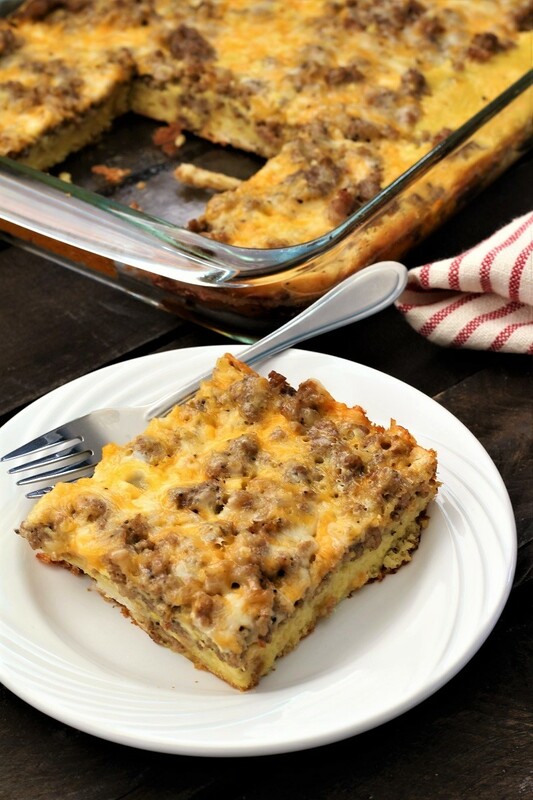 We love this Overnight Breakfast Casserole. We have it for breakfast every Christmas morning. Thank you for featuring the Casserole and we hope that you enjoy it as much as we do!!! This looks great! I have been thinking about something like this for Christmas guests. Thanks so much for the great recipe! 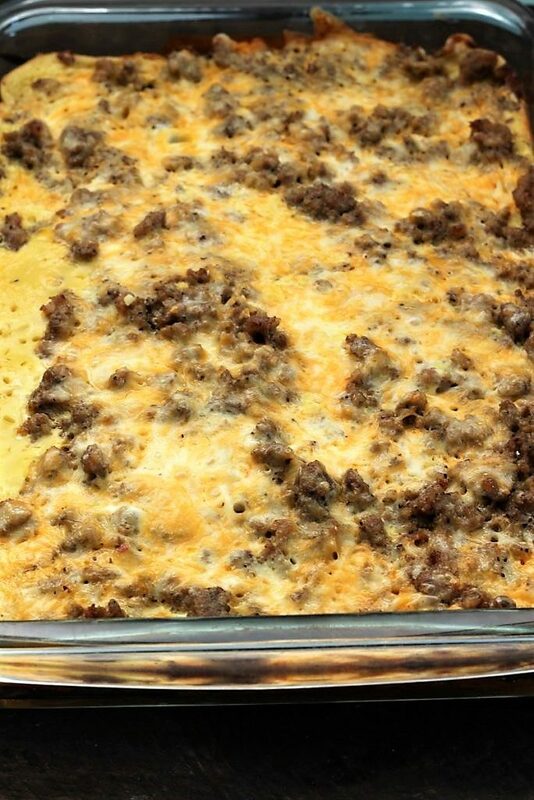 I love this casserole and it is a family tradition at our home! Happy Holidays and enjoy!